Perfect Parenting? Dream on parents! The basic context in which we bring children into the world and do all our work in caring for children is the covenant God who made all who love him and who seek to walk in his ways. He has promised to love not only us, but also our children (Genesis 22:15-18; Exodus 20:5-6; Acts 2:37-39). But, do these wonderful promises mean that our children will not go through difficulties and even times of turning away, rebellion and dissolute living? Consider the reality that we are not perfect ourselves—our own lives are damaged deeply by sin in every area. We do not pray as we should for our children. We do not live before them in full obedience to the Lord in everything we do. We do not teach them perfectly the glorious truth that we know touches every area of life. In addition, we do not bring perfect children into this world. They bear the stain of Adam and Eve’s sin etched right through them—though they also bear God’s glorious image. Our children also bear the inheritance of our particular brokenness. So, with this understanding of our own and our children’s sinfulness, we should not be surprised by Jesus teaching a parable like that of the Prodigal Son, or perhaps the Parable of the Two Lost Sons (Luke 15:11-32). As we reflect on the hardness of our own hearts when we read a story like this, we have to be honest enough to acknowledge that, at one time or another, we have all been prodigals; and we have all been elder brothers. But, notice here we have a story with a good father—a father who represents the goodness, generosity and kindness of God. Yet, his sons have little respect for him. Both receive their inheritance, but neither is grateful or appreciative of their father’s generous spirit. The one wastes all he is given and finally comes to his senses. He is welcomed home with extraordinary grace. The other is angry, resentful, self-centered and self righteous. We never hear whether he comes to repentance for the story leaves that question hanging unanswered. Yet this troubled family is one that has a perfect parent! You and I are not perfect as parents or in any other way. 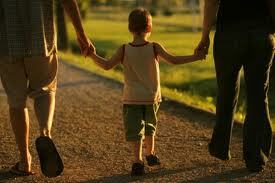 Realism about ourselves and our children is essential as we undertake the task of being parents. Trust in the faithfulness of our heavenly Father also is essential! All through our lives our primary hope is in His love for our children and His work in their hearts as He draws them to Himself, prays that their faith will fail not (even when they deny Him) and welcomes them back when they wander away. As finite people created for humble dependence on our heavenly Father, and as sinners who are in desperate need of the Lord’s help we need to commit ourselves to pray for our children as the most important work that we can do. Like the apostles who, we are told, committed themselves to prayer and the ministry of the Word (Acts 6:4), we as parents are to commit ourselves first to prayer and also to the task of parenting. What are our other responsibilities as we try to raise children to love God and serve Him? We are called to bring them up in the training and instruction of the Lord (Ephesians 6:4), and to work hard at communicating the truth of the good news to them (Deuteronomy 6:1-9; 2 Timothy 3:15). We need to be reading God’s Word with our children, and talking with them about the truth and its implications for our lives. We can find good books to read to them from early childhood to encourage and stimulate their budding faith and understanding. We need to work at helping them with their studies all through school and college, recognizing that this will require our sacrifice of time and energy. We worked at trying to help our three sons with every paper they had to write all through high school and college—especially when the papers required interacting with cultural ideas that are in any way in opposition to biblical truth. We sought to do this even if it meant having to read up on some subject that was completely new to us. God’s Word asks us to be an example of righteousness in every aspect of our lives (Deuteronomy 5:32-6:3; 2 Timothy 1:5). A woman (and a man) of noble character is hard to find, but her children will rise and call her blessed, because of the model that she is of faithful obedience to God and because her works bring her praise from all around (Proverbs 31:10-31). In Proverbs, Solomon speaks with great affection of the teaching and example of his mother (31:1-9). In addition, the model we give of love and respect for one another in our marriages is an essential element of training. If we fail in this area (as did David with his undisciplined sexuality), we will see problems in our children. He could not teach them sexual modesty, chastity or fidelity for he was not sexually modest, chaste or faithful himself. Look at the disastrous consequences in the life of his sons. On the other hand, fidelity, chastity and discipline in our sexuality bears wonderful fruit in our children’s lives. A perfect example is my own parents. We were very poor and lived in a tiny home in which one could hear every word, day and night; yet, I never once heard either of my parents say an unkind or disrespectful word to each other. I saw my father treat my mother with great tenderness and affection—always. I saw them constantly honoring each other and serving each other. My parents at that time were not Christians, yet they had an excellent marriage and their example has been an enormous help to me as a husband and father. In addition we need to demonstrate honesty, integrity, faithfulness, justice, mercy and generosity in our work. My father-in-law is a wonderful model here. He was a farmer in central California who grew peaches, nectarines, plums and persimmons, as well as some grapes and kiwis. I came upon him one day kneeling in his orchards offering the first-fruits of his young peach trees to the Lord. Dad was kneeling there holding up a peach in his hand and he was saying: “Lord these peaches are yours. These trees are yours and all the fruit they will ever bear. This orchard is yours. My farm is yours. I am yours. Help me to serve you in all I do.” Dad had never been taught in his church to put into practice the various offerings and services in the Old Testament Law that were required of the people of Israel. But he read the Bible himself and so he had decided that he would regularly have this service of first-fruits just between himself and the Lord. He never told anyone about it—it was a private matter between himself and the Lord. The consequences of this little ceremony were remarkable. He did not ask about his “bottom line” when he was thinking about paying the men who worked on his farm. Rather, he asked what would be pleasing to the Lord. When he gave, he gave generously without thinking about how much precisely he could afford. Many years—and he was not a wealthy man—he gave away more than 50 percent of his income. He gave to his church, to ministries and to many individuals. In this setting of the first-fruits of faithfulness in our own lives, it becomes possible and powerfully effective to teach righteousness to our children. My three brothers-in-law all have been shaped in the way they think about their work, the manner in which they treat those who they employ and their generous giving by the example of their father. As I look at their lives I see that the fruit of their father’s righteousness did not fall far from the tree. As we think about training in righteousness we also are called to discipline our children, not so much for disobedience to family rules, but for disobedience to the commandments of God. Any discipline must be for their good, and not have the effect of embittering them (Ephesians 6:4; Colossians 3:21; Hebrews 12:7-11). All children need the support of a community of people who share their convictions and who love justice, mercy and faithfulness. The New Testament describes the church as the family and household of God. This is where our churches and Christian friends become so important. Every parent needs to be committed in principle to the church as God’s family and needs to be humble enough to know their need of support, and therefore welcome the help of others in communicating Christian truth and encouraging character development (1 Timothy 1:2). Children need believing friends with whom they can grow together, and with whom they can share their struggles. They need older Christians who can encourage them in their faith, and to whom they can express their doubts and questions. In the church I served in England there was a man who was paralyzed from the neck down as the result of a gymnastics accident. He never became bitter and continued to love sports. After worship every Sunday his wheel chair would be surrounded by a group of boys talking eagerly with him about whatever was happening in sports that week. Philip and his wife ran the youth group for many years; he would train the young people how to care for him when his wife was away; he would write to many of them when they went off to study at college—tapping out his letters on his computer with a special stick he holds in his mouth. He was an amazing example of cheerfulness to everyone and a great help to all the youth of the church. When we moved here to St. Louis our sons had a hard time adjusting to this very different culture, especially to the culture of the church. One of our students at the seminary was a great help to us—Mark Long. He was running the youth group at ChesterfieldChurch and my eldest son used to cycle over to his apartment here on campus any time of the day or night knowing he would be welcome and that he could talk to Mark and his wife, Frances, about anything. Mark and Frances had five children of their own, but anyone who engages in youth work needs to have an open hospitable home like this. I still thank God for them whenever I think of them. Our children also need to learn that Christ calls us to live in the world and to serve him in the world (John 17:15-18). We are to work at preparing them to understand the ideas of our time that are in opposition to the knowledge of God (2 Corinthians 10:4-5). We should be practicing hospitality to unbelievers, the needy and “sinners” so that all through their lives our children have involvement in the brokenness of people’s lives modeled for them and a regular part of life for them (Luke 14:12-14; Hebrews 13:2; James 1:27). We need to be “friends of sinners” (Matthew 9:10-13; 11:19), and we should be encouraging our children to be the same. A big issue for all parents is the education of our children, and the challenges that face us as we struggle to bring our children up in the knowledge of God. What are our educational responsibilities to our children? How do we help them to face hostility toward the Christian faith in the culture in which we live? How can our churches help in this task? Do single people, parents without children and others whose children are already adult have a part to play? What choices ought we to make with regard to schooling? How are we to think about others who make different choices from one’s own? These issues, particularly the question of schooling, have become battlegrounds among believers and a cause for mutual criticism and recrimination. Those who choose public schooling are sometimes accused of sending their children off to Babylon or Sodom. Those who choose home schooling are condemned for being too protective of their children. Those who choose Christian schooling are criticized for having an elitist or a “retreat” mentality. One can point to children who have lost their way after aggressively secular public education, children who have become rebellious after separatist Christian schooling, children who kick over the traces after getting away from a claustrophobic home learning situation. But, none of these examples are helpful to us in furthering the discussion, because we can point to children who have had every type of educational experience who love the Lord and serve him faithfully. Perhaps the first lesson we need to grasp here is that this is a disputable matter, and that even if we have strong convictions about what we think is right, we are to respect the choices that other believers make. Even if we are convinced on biblical grounds that they are wrong (Romans 14:1-15:7), we need to recognize that we do not have clear biblical warrant for our schooling choices. However, each one should be convinced in their own mind; yet we also must accept one another in order to bring praise to God, and not judge our brothers and sisters for whom Christ died. Raising children is a difficult task, whatever choice we make. We all need the support, encouragement and prayers of one another as we seek to be obedient to God’s calling (faculty). Who is sufficient for all this—whether it is praying for our children, teaching them truth and righteousness, being an example of Christian obedience in everything, providing an excellent community, engaging constructively with the world or providing the best education? Not one of us, but with the help of the Lord and of one another, we can hold on to the promises of God’s Word and He has committed himself to be faithful to us and to our children. Jerram Barrs is Professor of Christian Studies and Contemporary Culture and Resident Scholar at the Francis Schaeffer Institute at Covenant Theological Seminary in St. Louis, MO. He is the author of several books. You can learn more about Jerram Barrs by visiting Covenant Theological Seminary online at www.covenantseminary.edu. This material was presented as a breakout session during the Fall 2005 Francis A. Schaeffer Lecture Series entitled “Two Worlds Under One Roof: Bridging the Generation Gap.” This article first appeared in Covenant Magazine. Reprinted with permission. 1. What comfort do you take from God’s covenant promises? Have you regarded prayer as your most important task as a parent? 2. Are there things that need to be changed in your marriage so that you will be an example to your children of love, respect, tenderness and service to each other? 3. Have you ever offered yourself and your work to the Lord in a way similar to the story that I told of my father-in-law’s first-fruits? In what ways do you see your practice of justice, mercy, faithfulness and generosity being a model to your children? 4. Read Romans 14:1-15:7. What do you think are some of the ‘disputable matters’ that cause divisions between Christians today? Are there matters where you find yourself judging other believers, which are clearly not definitive of what it means to be a Christian, and in which you ought to be more respectful of the opinions of others? 5. Have you become involved in the hostility that is so often expressed with regard to the subject of education? Are there attitudes, words and actions for which you should perhaps ask forgiveness from the Lord? Are there any fellow believers to whom you ought to apologize for hurtful words you have said to them regarding this issue? 6. If you are parents, regardless of what kind of schooling your children have, what efforts are you making to obey Deuteronomy 6:4-9? 7. If you are parents, regardless of what kind of schooling your children have, what are you doing to help them think about the issues raised by their studies and by the papers they have to prepare? 8. If you are single, or married without non-adult children, in what ways are you being a help to children and young people? What could you do to help provide the community of the church that they need? 9. What good things are being done in your church to help high school and college age young people cope with the challenges of the culture? What else do you think could be done? 10. Are you modeling for young people and children being a “friend of sinners?” When did you last have unbelieving friends in your home for a meal together? This is a great article! I am printing it. Thanks for posting.